First of all, i would say that am a big DBZ fan. But it is true that DBZ movies lack something that the series had.. this one is not an exception. We get to see more of Trunks and Goten in this one. Broly, the legendary super saiyan who was defeated in one of the previous movies came back to defeat kakarot. He was awakened by goten whose cry resembled to that of Goku's when he was a kid. It was stupid because when goku was infant, so was broly by that time... we never know how he reminisced goku's cry so well. 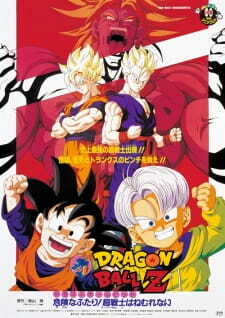 The strength of this movie lies in its climax where we get to see a 'family kamehameha' of goku, gohan and goten. That was one of the most memorable moments of the series. there are also some good comic scenes in involving goten and trunks which are good to watch. Videl is quite annoying. this is only for those who do not mind the loop holes of the plot (as there are many). So finally i say, do watch it if you are a DBZ fan. Broly: The Second Coming is quite possibly the worst out of the DBZ movies. I mean this movie is absolutely terrible from the beginning to around the last three minutes. Dragonball Z has always been something that was heavily focused on its action. Unfortunately, the action takes a backseat to some horrible and very annoying comedy, and it doesn't even deliver on the action when it finally gets there. Also, like the previous movies, this is not something a newbie can jump into. Someone new to the franchise will be completely lost, but for the fans, this actually feels like it could have taken place at some point during the Great Saiyaman Saga. The plot follows Goten and Trunks as they search for the Dragon Balls to make a wish. Their journey ends when they meet up with the blood thirsty Broly whom confuses Goten with Goku. This begins a cat and mouse game that sees Goten and Trunks doing whatever possible to stay alive until someone stronger can battle Broly. Do not come into this movie expecting anything you saw in Broly's first appearance. Now the first movie wasn't great by no means, still though, it managed to excel where it counts for the most part. Plus it had a more interesting cast to work with. Here, the pacing is atrocious, and I find this movie very difficult to sit through to the point where I have to hit the fast forward. Trunks and Goten are the main characters here and their ridiculous antics are at their peak. These two characters are barely tolerable in small doses, so giving them their own movie can only be described as cringe-inducing. The plot is incredibly boring, and a person may think that things would pick up when Broly finally makes his appearance. Unfortunately, the writers saw fit to turn Broly into a one dimensional idiot that had a hard time killing two Saiyan children and a human girl. I found him to be very disappointing when comparing him to his first appearance. The action scenes completely lack imagination and are uninspired. The production values aren't half bad though. I didn't have an issue with the animation, and the light show during the final moments is a plus. The action doesn't consist of the reused cel combat, but I was actually missing at least that much, since the rest of the action was so weak and slow. The BGM attempts to add some type of flare to the action, but it simply cannot save these poor segments. So what do you get when you have a movie with very bad comedy, rotten action, and a weak antagonist? Well, you get Broly: The Second Coming, and I wouldn't recommend this to anyone other than serious DBZ fans. This flick is that bad. Time to tackle a DBZ movie for a change, since my previous reviews were on Pokemon movies and 1 Pokemon short. As with my other reviews, I'm looking at the English dub and not the sub. However, I did manage to watch the full, uncut version of this film, so there can't possibly be any deleted scenes that would affect this movie's score like there were with previous ones. Story: Due to this being a sequel to, arguably, one of the best DBZ movies that have been made, the story isn't as detailed as before. There's no backstory to why Broly wants to destroy Earth since almost everything about him was explained in the previous film, which I'm fine with. However, what I'm not fine with is characters randomly popping out of nowhere to save the day without much explanation outside of "I was in the neighborhood and figured you'd want help". There's also some incredibly thick plot armor surrounding just about every character since no matter what Broly does to them, the most he does is just knock them out. This series pretty much thrives on characters dying and they've worked around the "Bringing back the dead only works once" rule several times, so it's not like they couldn't have killed at least someone off. There's also the matter of some really childish jokes, mostly piss jokes, that I'd expect from an Adam Sandler movie, not DBZ. Art: The artwork for this movie is the same as the show, which I find a bit upsetting since most anime movies based off the shows can at least put a bit more detail into the movie than the show can. However, it's not that bothering since the artwork of the show isn't the worst I've ever seen. Sound: I have a mixed bag with this. On one hand, the soundtrack is amazing, pretty much like most other DBZ movies. There's some amazing songs that get your blood pumping for the fights, which I love. On the other hand, though, some of the voice acting is either terrible, annoying, or both. I've never liked Goten all that much in the show due to how annoying he can be and how terrible his voice sounds. While some would defend him saying that he's just a kid, so of course he's going to whine a lot and just be overall annoying, I'd say look at how Gohan developed. Yeah, he started off annoying as well, but once he got used to being a fighter, he became pretty cool. With Goten, he's already a pretty good fighter, but still annoys the crap out of me. There's also a lot of supporting actors that do a terrible job at voice acting, but at least they only get a few lines. Character: Like stated above, I don't like Goten. At all. However, the other characters aren't as bad, but most just serve as distractions until the real fight begins between Gohan and Broly. Videl gets knocked out pretty early on which is followed by a lot of piss jokes along with other childish humor from Goten and Trunks. Enjoyment: I personally find this not only the weakest of the Broly trilogy, but the weakest of all the DBZ movies I've seen. While the action was great, it doesn't really get started until the second half. While that's the same case with the first Broly movie, at least that one had the excuse of building up Broly as a character whereas this one just uses it to fill time until Gohan arrives.